Hannah Potts was born about 1821, the daughter of Walter Dunn and Charity Potts. In the 1850 Lenoir County census she was 30 years old and living in the home of Walter and Cynthia Dunn. A Dunn descendant says she was a nurse in the home. 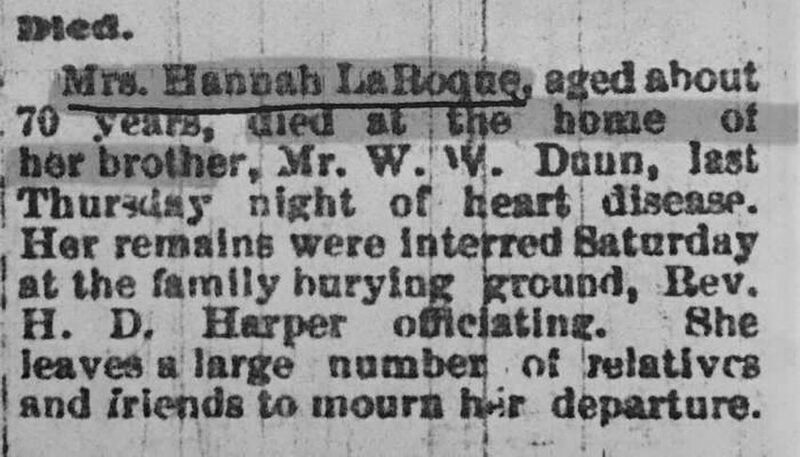 Sometime after September 1860 Hannah married Dr. Frederick Laroque whose first wife, Mary Elizabeth Dunn, had died. Frederick H. Laroque Bible - Frederick Horatio LaRoque was a son of Dr. James LaRoque II and Louisa Mabson of Wilmington. He came to Lenoir County to practice medicine where he met and married Mary Elizabeth, a daughter of Walter Dunn and Cynthia Loftin. The LaRoques settled in Contentnea Neck Township of Lenoir County. He died 7 Dep 1865, aged 47 years, 3 months and 27 days. 2. Second Class - August 5, 1867 - $20 per term - Sarah E. Hines, Amelia G. Hines, Alex. Dawson, Geo. B. Wilson, Mattie or Hettie B. Wilson, W. W. Rouse, Samuel E. Lee, Rich. E. Hill (special at $10), R. Daniel (?) Hill, Wm L. or S. Hardy, Jesse J. Aldredge, Lemuel Hardy, Levi S. Hardy, R. C. Croom, C. R. Ferebee, Walter LaRoque.